alex-l removed a member for VDG: alex-l.
Pixel_Lime awarded M128: Plasma Sets a Like token. 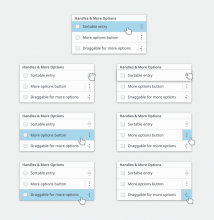 alex-l added a comment to T10047: Guerilla UX testing: a GNOME switcher. alex-l added a comment to D18321: support for the concept of expandible items. alex-l added a comment to M128: Plasma Sets. alex-l added a comment to T10325: 5.16 Login screen improvements. alex-l added a comment to D17310: Use a Kile Icon that is similar to the original. niccolove awarded M128: Plasma Sets a Love token. alex-l committed R985:d1bfb0aa37e6: Merge branch 'master' of ssh://git.kde.org/websites/hig-kde-org (authored by alex-l). alex-l committed R985:b3a694fc8f5e: Always provide an icon for toolbar and maybe a label (authored by alex-l). alex-l requested review of D16907: Always provide an icon for toolbar and maybe a label. alex-l added a comment to D11880: Add firewall-config and firewall-applet icons. Very cool icons! But in the panic one the padlock is too small :-/ what a about a checkmark (✅) on the wall instead? This is a test notification, sent at Fri, Sep 14, 2:26 PM. alex-l added a comment to M132: Plasma Mobile Clock. alex-l added a comment to M129: Plasma mobile weather app. alex-l updated images of M130: KTimer + Kirigami. alex-l created M130: KTimer + Kirigami. alex-l created M128: Plasma Sets. alex-l added a comment to T6929: Telephony functions. alex-l created T8963: Mockups for Plasma Mobile (Kirigami) Applications. alex-l closed T2269: Left and right margins for list view as Resolved. alex-l added a comment to T8760: Ideas for icon indicating move/slide/reveal actions. Marco said it's technically impossible. alex-l closed T8760: Ideas for icon indicating move/slide/reveal actions as Wontfix. alex-l committed R266:21122c0d77b9: fix handle-right (authored by alex-l). alex-l committed R266:ada60953d830: fix handle-right (authored by alex-l). alex-l committed R266:085d11995e4f: updated handles and overflow-menu (authored by alex-l). alex-l added a comment to D6280: Dolphin softer drop shadow for thumbnails. Thank for this, can you please share screenshots with dark themes, at least Breeze Dark? alex-l added a comment to D12756: [KDateTable] Use more appropriate and readable text colors for weekends and holidays. Gray seems OK to me. And I confirm the bug with Saturday column. alex-l updated the summary of D13137: Updated handles and overflow-menu-*. alex-l requested review of D13137: Updated handles and overflow-menu-*. alex-l added a comment to T8747: Putting KDE's videos to the alternative video platform PeerTube. alex-l updated subscribers of M127: Card layout and card content layout for Kirigami and Discover. alex-l added a comment to M127: Card layout and card content layout for Kirigami and Discover. alex-l added a comment to D12983: (icon view) Text width relative to icon size. alex-l added a comment to D13031: [ProcessModel] Center more column headings. alex-l added a comment to D12992: New elisa icon. 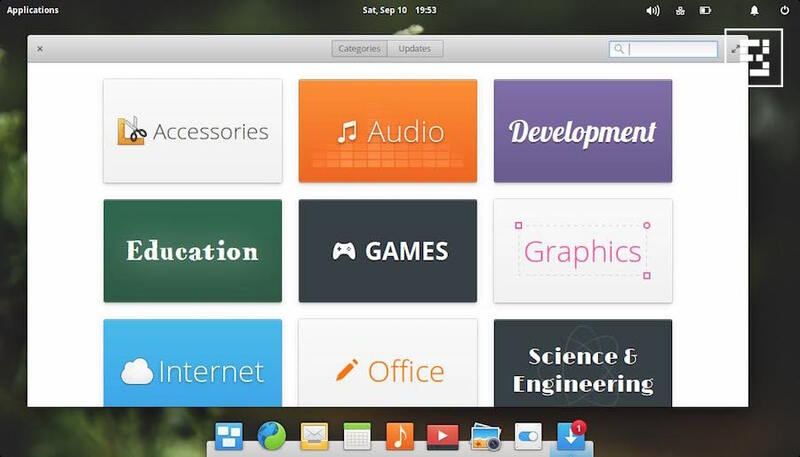 alex-l added a comment to T7913: Make it really obvious where newly-installed apps can be found. What about a blue dot on the launcher icon and a new tab in the launcher named "newly installed"? The dot will disappear when the user will open the newly installed tab. alex-l added a comment to T8707: Window borders. +1 for no-side borders by default. 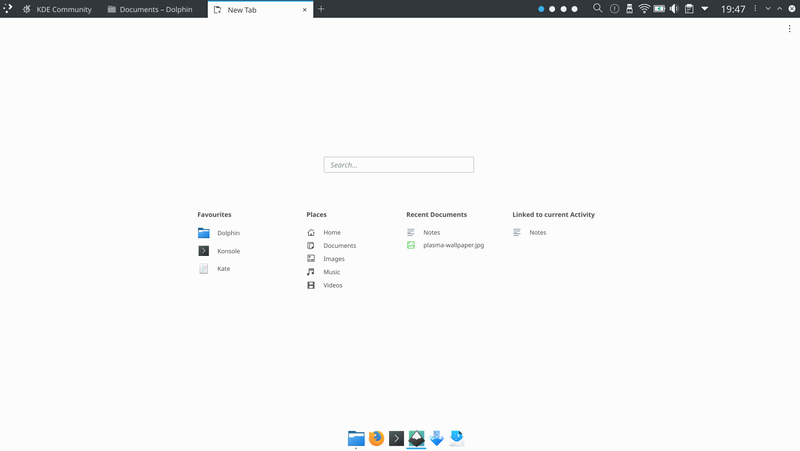 Also, titlebar and bottom border can have custom colors using KWin rules (for example if a distro ships Telegram it can ship in the same package a KWin rule to match colors), so consistency is not a issue there. The real issue is that apps draw widget near the side borders, so we just need to disable them by default. 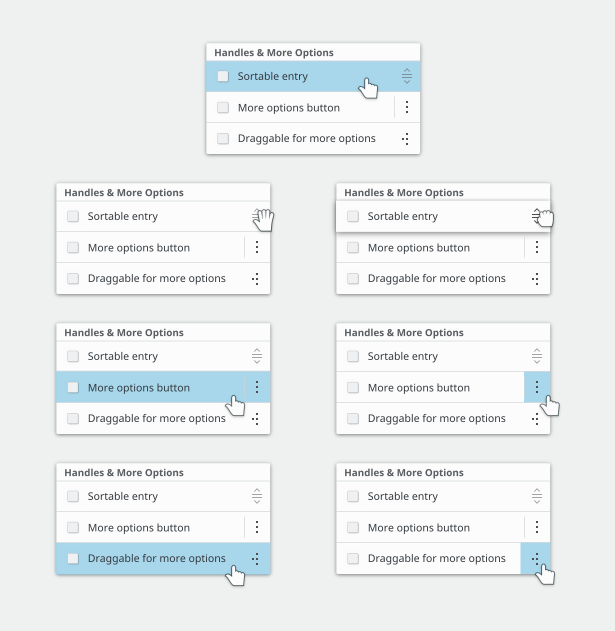 I use this settings since KDE4 and I have no issues with it. alex-l updated image descriptions of M127: Card layout and card content layout for Kirigami and Discover. alex-l created M127: Card layout and card content layout for Kirigami and Discover. Do you mean a icon with the following points? alex-l added a member for VDG: alex-l.
alex-l created T8749: Handles, more options buttons and right click menu. 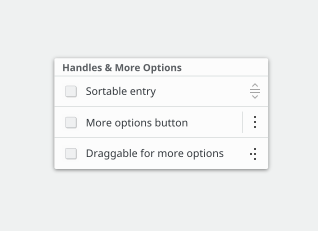 alex-l added a comment to D12960: Drag handle to reorder items in a ListView. 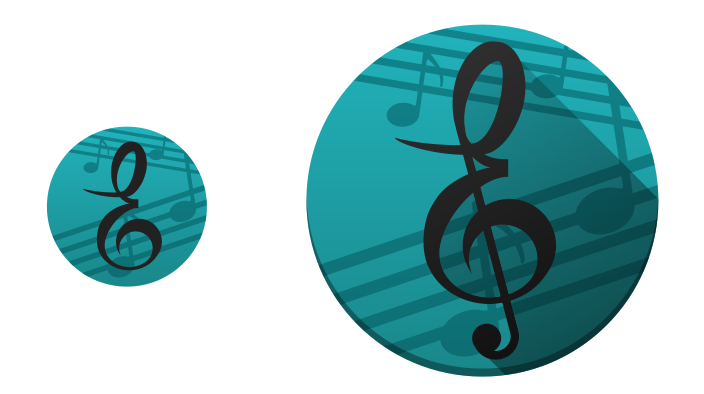 I tried with arrows too, but I think the fifth one looks better... my second choice is the third one. alex-l added a comment to T8281: Make runcommand great again. Also we decided against KNS because the resources are potentially dangerous and our users may install viruses like this. This is a test notification, sent at Wed, May 9, 3:09 PM. alex-l added a comment to D10494: update handle- icons for kirigami. This is a test notification, sent at Mon, Oct 16, 3:40 PM. alex-l added a comment to D8232: Add option to center shadow . 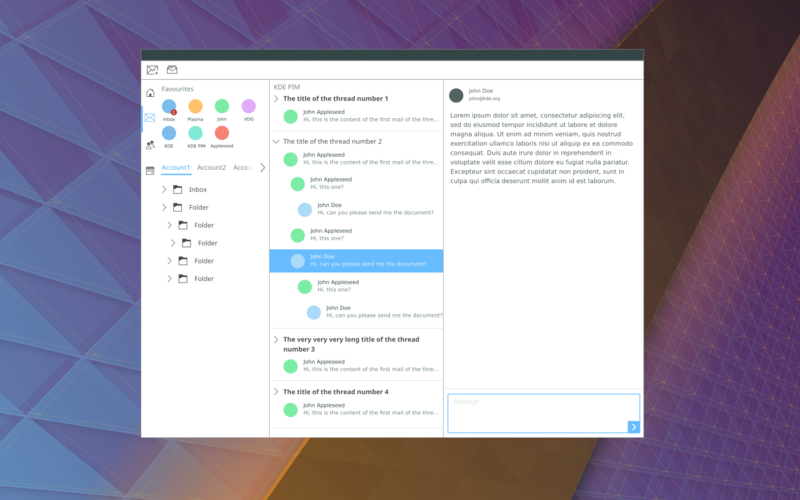 Absolutely +1, I was waiting for this option since Plasma 5 was launched. I suggest to make it default, I can't really get why the shadow should be on the right. alex-l added a comment to T5439: Discuss todo/release/review process for HIG. alex-l updated the task description for T6843: Integration with FOSS online services. alex-l added a comment to T6854: Modernizing Kontact look. alex-l added a comment to M105: Katie. alex-l created T6843: Integration with FOSS online services. This is a test notification, sent at Thu, May 4, 3:57 PM. alex-l created M100: [Kirigami] Infobox in context menu. 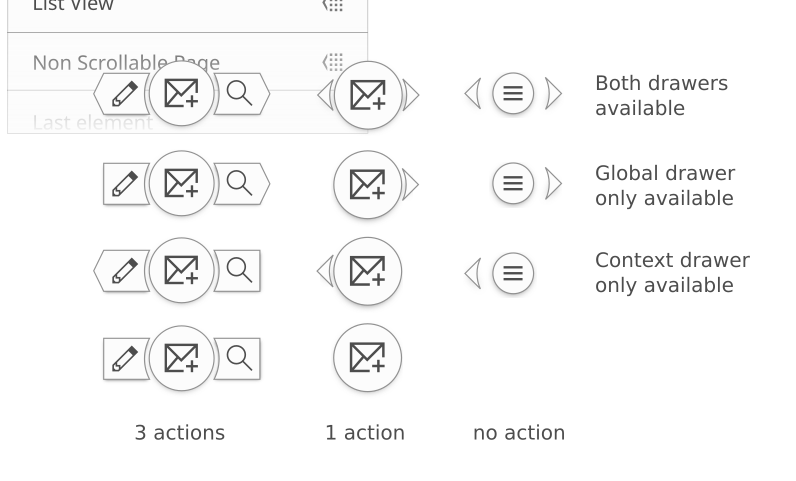 alex-l added a comment to M90: Sensible icons for Plasma Activities (action icon). alex-l created M97: Custom Action Buttons for Browsers. alex-l added a comment to M96: Discover bottom bar. alex-l added a comment to M95: Kirigami: software center example. alex-l added an inline comment to M95: Kirigami: software center example. This is a test notification, sent at Sun, Mar 19, 11:12 PM. alex-l added a comment to M94: Kamoso + Kirigami. alex-l added a project to M95: Kirigami: software center example: Kirigami. alex-l created M95: Kirigami: software center example. 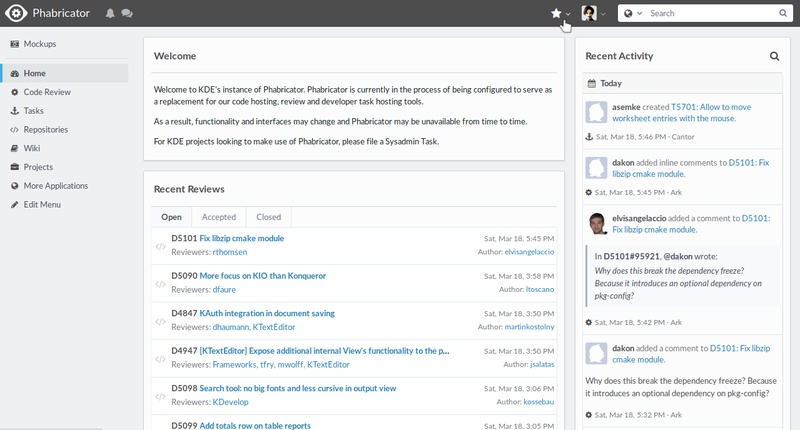 alex-l added a comment to M92: Phabricator CSS changes. Wouldn't the header bar be better in black? alex-l added an inline comment to M93: Papercut-fix Suggestions Kirigami. alex-l added a project to M94: Kamoso + Kirigami: VDG. alex-l created M94: Kamoso + Kirigami. alex-l added a comment to M91: Kamoso Mockup - early Kirigamification. This is a test notification, sent at Fri, Mar 17, 5:51 PM. alex-l closed T5487: Investigate why new contents are not downloaded by apps like Dolphin as Resolved. alex-l committed R266:121122fb9b12: Added MIME-type icon for Dockerfile as text-dockerfile (authored by alex-l). alex-l created T5487: Investigate why new contents are not downloaded by apps like Dolphin. This is a test notification, sent at Tue, Feb 21, 12:09 PM. This is a test notification, sent at Tue, Feb 21, 12:08 PM.